A long day of traveling from San Marcos to Boston has come to an end. Along the way, we met some new friends and shared the blog with them! We visited with Adrian who served us a quick glass of wine at the Newark Airport – – after a three plus hour flight and 30 minutes on the ground waiting for a gate! Jean enjoyed a beautiful Italian varietal with lots of fruit and Brian went with a big, full bodied Cab. As we got in line for the flight from Newark to Boston, Jean struck up a conversation (wow, now that’s a surprise) with a woman who was heading home to Boston after spending the week in the ‘Austin area’ – she apparently had been on our flight from Texas. After a few questions and exchange of pleasantries, we found out that she was working in San Marcos for her company and had been staying at the Hampton Inn. Oh, and to add icing to the cake, her seat assignment was in our row. So, the three of us chatted up a storm (which is no surprise to those that know us) during the 40 minute flight. She told us about places in Boston to check out and we told her about places – way better than Red Lobster – to check out in San Marcos. Ironically, she will be heading back down south in a week or so and we plan to get together for dinner. It’s the stuff that small worlds are made of and it clearly made our night. Once we found our way to the hotel (so – there is snow on the ground that is leftover from the artic blast that barreled through the area a week or so ago – amazing!) and got checked in and walked into our room to find two ‘double’ beds instead of a king size bed. Now you notice we put ‘double’ in a quote mark – – – well, because the beds looked more like an over-sized twin as instead of a true full. A trip back to the lobby yielded a king size bed – albeit a long hike, but alas the bar was still open and across from the check-in desk . . . isn’t that convenient! Here we met Marc, who’s been a part of the hotel for seven years this month, and as he brought out our bottle of 2008 Billi Billi Shiraz from Australia, we started talking about sports. Marc, it turns out, is a HUGE Cowboy’s fan (ok, we tried to be polite – but just because we live in Texas does not mean we are Cowboy fans – for the record, we are not) – – – as well as a Red Sox, Bruins and Celtics fan. You get the picture? A Cowboys fan in Patriots country! Actually, we had a wonderful visit and look forward to visiting more with him during our stay. So, according to the label, the wine contained – “Deep, dense purple Boysenberry and blackberry fruits, layered with spice and liquorice cool climate characters. Fine tannins are supported by bright berry fruit and delicate spice characters, medium bodied with good length of palate.” Yeah, we read that and started picking up all of it plus a lot more. This is a really nice bottle of wine that typically will sell for less than $13 a bottle. We liked the fresh aroma of fruit on the nose and the hint of vanilla on the finish. A big wine that didn’t pour big initially. It’s a wine that gets better as it opens up and has some time to breathe. This wine is from the Victoria region and is a different style compared to wines from Barossa Valley or McLaren Vale, but just a tasty. We really liked it a lot and were lucky that Marc still had the bar open for us to try it. Gonna have to track it down when we get home. Planes don’t always leave on time or arrive on time. Parking is usually a problem at airports and other places when you’re on the road. But one of the things that makes traveling just a little more bearable is when you meet people who – well, just make a difference in your day . . . and today that was accomplished in a big way. It really made our trip fun and memorable – and we’re just getting started! Looking forward to a fun weekend with Daughter #2 and exploring her world up this way . . . oh, and trying to stay warm! Here’s to the weekend. Enjoy your favorite wine responsibly and remember to recycle whenever possible. See you back here tomorrow! 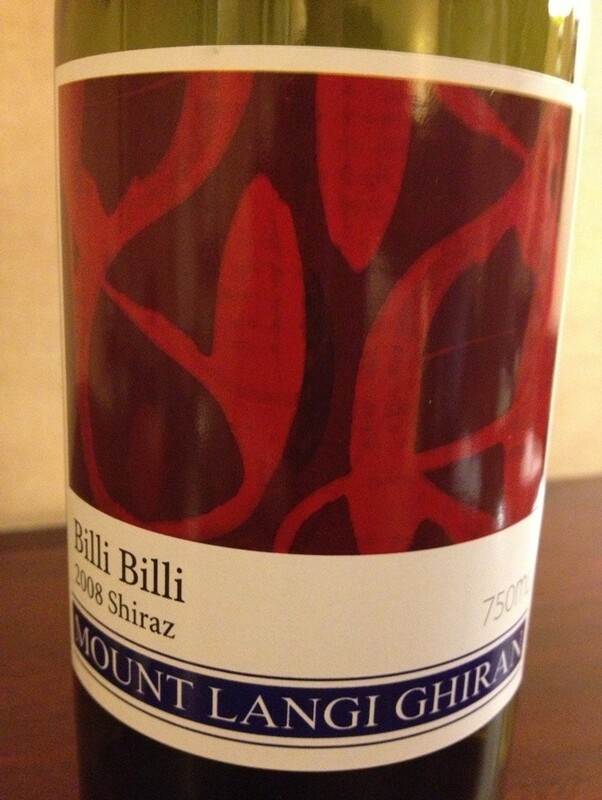 Categories: Uncategorized | Tags: Billi Billi Shiraz, Boston, Cowboys, Newark Airport, San Marcos | Permalink.